What is the Infinite Thinking Machine? 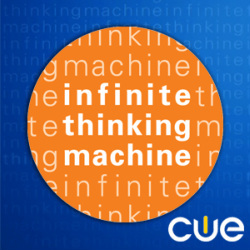 First launched in 2006, the Infinite Thinking Machine (ITM) is a high-energy Internet TV show directly targeted at K-12 educators, parents and students. Our goal is to inspire creativity and innovation in education. New episodes are released fortnightly during the school year, and we'll occasionally post bonus episodes. The show features a classroom teacher as its host, engaging educators as "Field Trip" correspondents and amazing innovators as guests. Innovative approaches to education are showcased, and the teachers, administrators and students behind them are celebrated. Special segments like 'HackEd' address deeper topics head-on, challenging conventional edu-thinking. Currently in its third season, the ITM depends on a mix of funding from its producing organization, education partners and corporate sponsors. The ITM is produced by CUE, a nonprofit educational community that inspires innovative learners. Mike Lawrence (@techmaverick) and Chris Fitzgerald Walsh (@fitzwalsh) serve as Executive Producers, and the "ridonkulously" talented Ramsey Musallam (@ramusallam) and Michelle Cordy (@cordym) as your hosts. Several behind-the-scenes ITMers make our show possible, including Mark Hammons, Staci DeGagne and Bill Selak. Long time fans of the ITM can see the original shows here or the original blog here. Have fun taking a stroll down memory lane! Have an idea for an ITM segment? Don't just sit there, tell us about it!